The 04 days' itinerary, "Discovering the spiritual essence of Haridwar & Rishikesh" will take you through the Spiritual centers of Haridwar & Rishikesh. We will walk through various narrow alleys of Haridwar to observe the spirituality, rituals, and traditions of the place. We will also witness the "Ganga Aarti" on the bank of the Ganges called Har Ki Pauri. In Rishikesh, your stay is in an ashram, where you could do meditation & yoga. a beautiful heritage “Haveli” (mansion) situated on the banks of the Holy Ganga, a mere 500 meters walk through the Bazaar from the sacred "Har ki Pauri" at Haridwar. It stands at the gateway to the Devbhumi – the abode of the Gods and the "Char Dham Yatra". The Haveli is an architectural marvel, where the ancient structure has been restored to recreate the old - world charm with modern day hospitality. The interiors of The Haveli are interestingly reminiscent of old Indian Mythological times where there are balanced tones of tranquility & comfort. Har-Ki-Pauri, the sacred ghat was constructed by King Vikramaditya in the memory of his brother Bhartrihari. 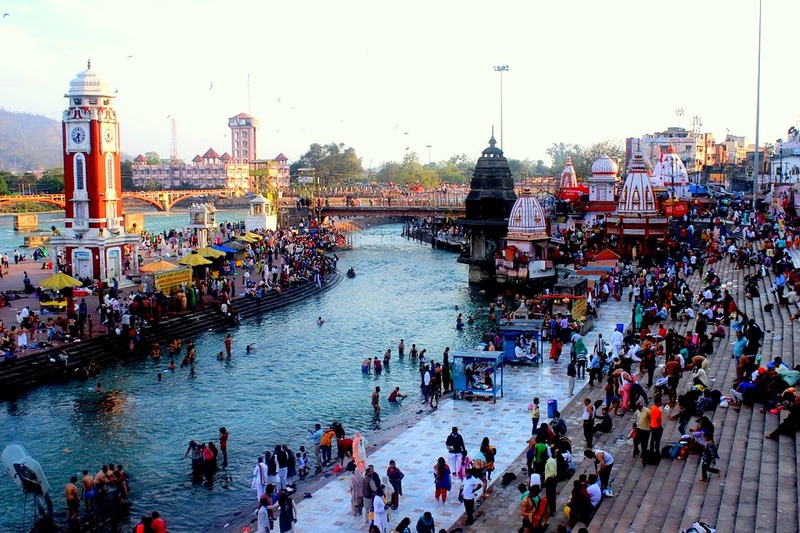 Haridwar abounds with several Hindu temples and Ashrams (Hermitages). More than the architectural designs, it is the spiritual ambiance of the place that is so striking. The Daksh Mahadev Temple is an ancient shrine situated to the south of Kankhal town. This temple was constructed by Queen Dhankaur in AD 1810. Kankhal has several other temples and ashrams too. The Sapt Rishi Ashram is situated along the Haridwar-Rishikesh road. The Ganges flows in seven streams in front of this Ashram, hence this place is also called Sapt Sarovar. The Kanva Rishi Ashram has situated around 42 km from Haridwar. The ashram is on the banks of the Malini River along the forest road to Kotdwar. Other important places to visit are the Bharat Mata Temple, Maya Devi Temple, Bhimgoda, and Shanti Kunj. The golden reflection of floral diyas in the river Ganges is the most enchanting sight in the twilight during the Ganga aarti ceremony at the ghat. The synchronized chanting of prayers that takes place during the Aarti is a very uplifting experience. Our representative would meet & greet you at your hotel in Delhi and would introduce your tour to you. Then, transfer to the train station to board your train to Haridwar. Meeting & assistance Meeting and assistance upon arrival, check into Hotel Haveli HariGanga. After rest & relaxation, we explore the unending list of attractions in Haridwar. This evening we suggest you walk across over the bridge to witness the fascinating Ganga ‘Aarti’ (invocation). This is the place for the systematic practices of the Himalayan Yoga Meditation Tradition come from the ancient cave monasteries of the Himalayas. The Tradition has an unbroken lineage of Guru and disciples relationships which is known to be at least 5,000 years old, and which traces its roots through the history of mankind and back to the primal energy or primal consciousness of the universe. You may let us know, if this sounds good, we will then revert to you with the relevant detail as per your interest & need. After breakfast, we will drive to Rishikesh. Upon arrival in Rishikesh, transfer to Swami Rama Sadhaka Grama Ashram. Here, we experience a holistic style of living based on simple Ashram rituals, living, and practices. The afternoon we will drive to Delhi. Upon arrival, transfer to your hotel address in Delhi. Expenses of Personal nature such as Laundry, Drinks, Telephone calls, etc. Heritage Walking Tours in Rishikesh.